The Paso Robles wine region sprawls over a good part of California's Central Coast. It sprawls so, that it was recently divided into eleven sub-AVAs. That's a testament to the variety of terroirs in the region's 600,000-plus acres, 40,000 of which have grapes growing on them. Hall Ranch, home of Robert Hall Winery, sports five sustainably farmed estate vineyards - 300 acres in all. They grow 21 different grape varietals there in the neighborhood of the Estrella River. Head winemaker Don Brady was Texas-trained, back before Texas had a wine industry of which to speak. He's been with Hall for nearly two decades. 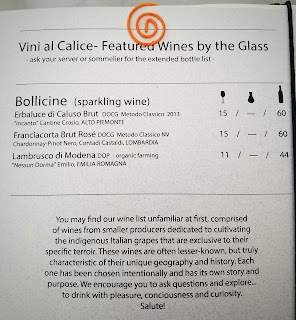 The winery likes to brag that they're all about knocking down barriers and exploring new frontiers, and I suppose the following wine fits right in to that mindset. It's not that Vermentino is such a rare beast, but that variety isn't exactly everywhere you turn in California. If you're new to the grape, see bottlings from Sicily or Sardegna to find out what all the fuss is about. 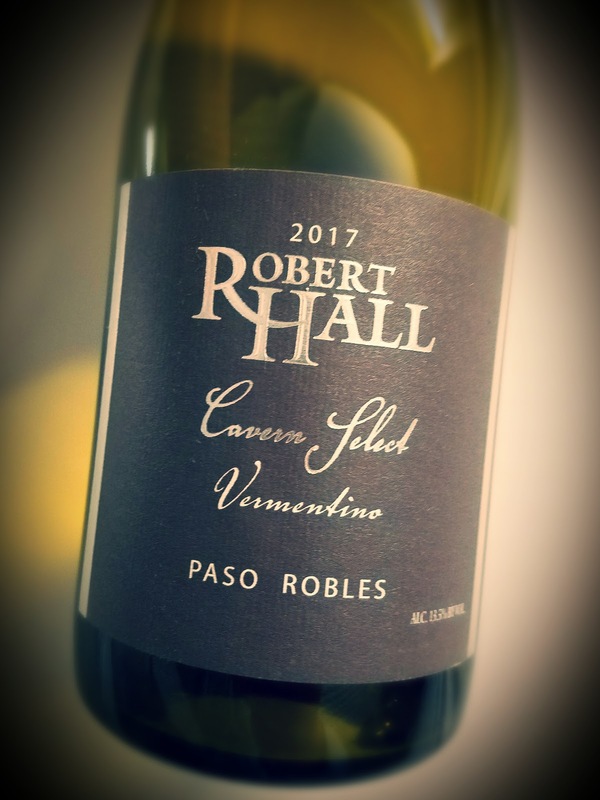 Robert Hall's 2017 Cavern Select Vermentino is only available to club members and tasting room guests. It boasts Paso Robles grapes, from the El Pomar appellation of the broader region. It's on Paso's east side, between highways 41 and 46. The vineyard is behind the winery, in the hills. Alcohol is reasonable at 13.5% abv and it retails for $28. The 2017 vintage was difficult, with too much rain, too much wind, a blazing hot September and a frost in October. The Hall folks like what they got for their trouble, though, as they say the wine shows "excellent maturity and depth of flavor." This Paso Vermentino sits green gold in the glass and offers up more oceanesque salinity on the nose than I'm used to finding in a California version of this Italian grape. There's a slant of citrus running through, but it's salty and slightly briny. I love that. The sip shows off the bracing acidity as well as a mineral-laden, lemon-lime flavor profile. The savory angle plays right through with the zest of lime and tangerine on the finish. It's time for oysters here. 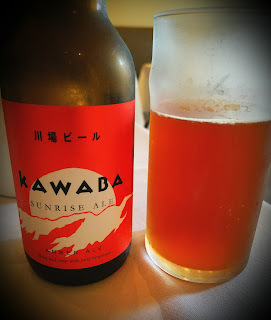 I've done a little more exploration into a Japanese beer that's available at my local sushi place, Kawaba Sunrise Ale. It's made in a brewery in Kawaba, which is nestled in the mountains northwest of Tokyo on Japan's main island. The label shows an origin of 'Denen Plaza Kawaba,' but that appears to be a roadside rest area, albeit an extremely nice one with shopping available. I presume the brewery is somewhere on the grounds in the village. The beer is malty, low-alcohol (5%) and leaves behind a pleasant bitter note that really hits the spot with seafood. My much better half and I were having sushi the other night. I love sushi, but the beverage options always leave me cold. I like wine, but the choices never seem good at a sushi place, at least not the ones we frequent. Beer always seems to be Asahi or Sapporo, neither a fave. Our sushi place offers an extensive selection of sake, but I've never delved into that ocean enough to know where I'm swimming. This night, I noticed a Japanese craft beer, Kawaba Sunrise Ale. Billed as a red ale, I figured it had to be pretty close to my wheelhouse. It was good, beery and ale-y enough to make both of us happy. But that's a fairly weak description, especially for a guy who can go on and on about wine. Why does beer stump me? I clicked my way over to Beer Advocate, as I do when I want to know what real beer geeks think about a brew. The Kabawa had - in one user's opinion - "some caramel malt sweetness and toasted grain… a lightly sweet, even creamy coating of caramel… an increased brown bread quality… some light hops spice… a dry tea leaf feel." And he didn't think it was all that complex. Maybe I'll just stick with "gimme an IPA." That's what I really want when I want a beer. 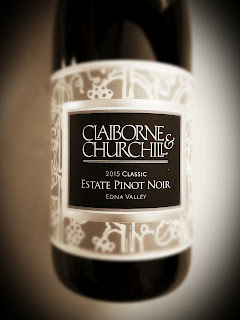 The Claiborne and Churchill label is 35 years old this year. The winery is located in the heart of the beautiful Edna Valley, just outside California's Central Coast town of San Luis Obispo. They say they are inspired by the wines of Alsace, specializing in premium Riesling, Gewürztraminer, and Pinot Gris, Pinot Noir and Syrah. For the sake of variety, they also produce a Pinot Blanc, a Chardonnay, a dry Rosé, and a Port-style wine. Established by wayward Michiganians (Michiganders?) Clay Thompson and Fredericka Churchill Thompson, they say their winery structure was the first straw-bale building built in California. Its 16-inch-thick walls mean they don't have to air condition or heat the place - it maintains the right temperature naturally. In it, they make 8,000 cases of wine a year. The 2015 Claiborne and Churchill Pinot Noir is made using grapes grown in their estate vineyards in Edna Valley. 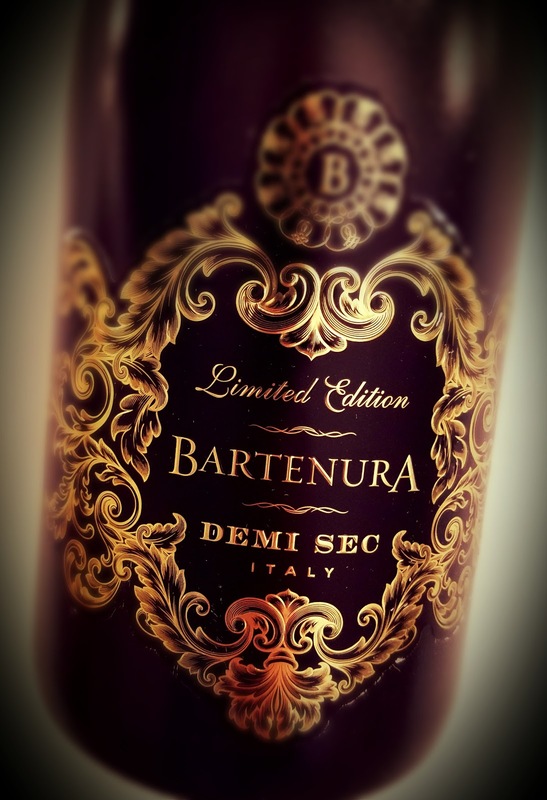 It was aged ten months in French oak barrels, only a quarter of which were new. Alcohol is restrained at 13.7% abv and it retails for $32. The medium-dark wine has a concentrated nose of cranberry, cola and black tea. A note of tar also pokes its head into the scene. The palate is lovely, a bit on the weighty side as California Pinot is wont to be, but dark, delicious and a dandy match for a grilled pork chop, lamb or holiday ham. The expected cranberry flavor is riper, more like cherry, and the full mouthfeel is satisfying. Its acidity is perfectly refreshing while the tannins are purposeful, yet manageable. Great wine is all about location. The location of the vineyard makes all the difference in the end product. Locations is an experiment of place for winemaker Dave Phinney, of Orin Swift fame, in which he makes wines from all over the world. These wines are labeled only with a big letter or two in a white oval, depicting the place of origin - F for France, P for Portugal, I for Italy, and WA is for Washington, much like those European bumper stickers. Phinney sold the Locations brand this summer to Modesto's E and J Gallo, two years after selling off the Orin Swift brand. A price wasn’t announced, but Phinney will reportedly stay on as the winemaker "indefinitely." For the fifth release of "F" Phinney has again tapped some of the best regions in France for grapes, drawing upon his network of growers from Rhone, Roussillon, and Bordeaux. Phinney says the grapes were grown in "exceptional old vine blocks located in revered sub-appellations." 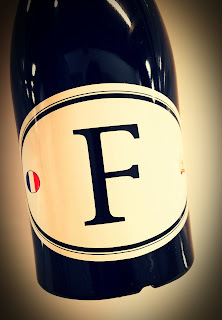 F5 is a blend of Grenache from the Roussillon, Syrah from the Rhone Valley and assorted Bordeaux varieties. The wine was fermented in oak vats, barrel-aged for ten months and has an alcohol content of 14.5% abv. It retails for about $20. The wine is all Rhône on the nose, with a huge tar element along with anise and the smell of a nice box of cigars. The medium-dark wine has a palate of the northern Rhône valley, too, and a splash from the Roussillon - just hint of Bordeaux, to my taste. Dark fruit abounds and the oak usage is a treat, not a detriment. Tannins are firm enough for a hanger steak and the finish lasts a long time with plums and blackberries lingering. Phinney says drink it now, or let it evolve for four years or so. German wines tend to fall beneath the U.S. wine drinker's radar. Aside from Riesling, you'd be hard-pressed to find a German grape variety or even a German version of a more familiar grape, on a supermarket shelf. Specialty wine stores will dig deeper, but depending on their inventory they may not have a very wide coverage. With this in mind I was thrilled to be asked to participate in an online tasting event involving German wines, with Matthew Kaner, wine director and partner at several wine bars in the Los Angeles area. The importer says Annette Borell and Thomas Diehl married and combined their families' three wineries into one, creating Weingut Borell-Diehl. The various vineyards reportedly have such varied soil as loess, limestone, red sandstone, with deposits of mineral-laden limestone in some vineyards. They grow, among other's, the Müller-Thurgau grape . The variety was created in Switzerland in the 19th century as an early-ripening grape that could better withstand cold winters. It is not very common in the U.S., but is reportedly the most widely-grown grape in Germany. Borell-Diehl's grapes are sustainably dry-farmed near Hainfeld in the Pfalz region, with no herbicides or pesticides used. 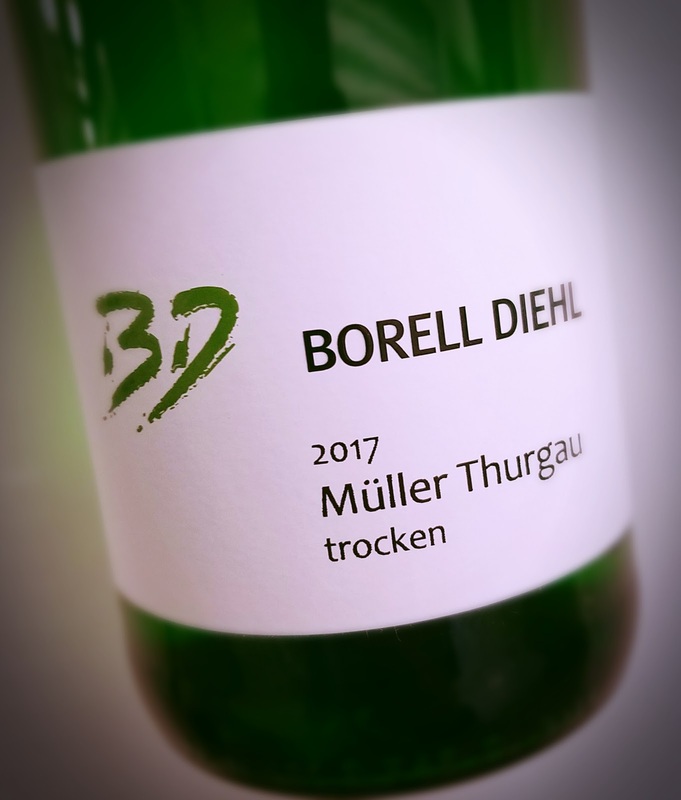 Their Müller-Thurgau hits a reasonable 12% abv and comes in a one-liter bottle, containing an extra glass of wine for the $12 price. The wine has a golden tint to it, although pale. The nose is beautiful, with apples and citrus at the forefront and minerals taking a back seat. Those minerals come in more forcefully on the palate, which is to be expected of a cool climate white grown in limestone soil. The lemon-lime flavor and the brisk acidity are quite refreshing. Here's a little sparkler from Italy, which lands on the sweet side, and is kosher. The Italian Bartenura winery was named for a 15th century rabbi near Forli who was known as The Bartenura for his commentary on Jewish law. The Glera and Moscato grapes for the Bartenura Demi-Sec reportedly came from "all over the greatest regions of Italy," which usually means the advantage of location is taken away in favor of more affordable fruit. 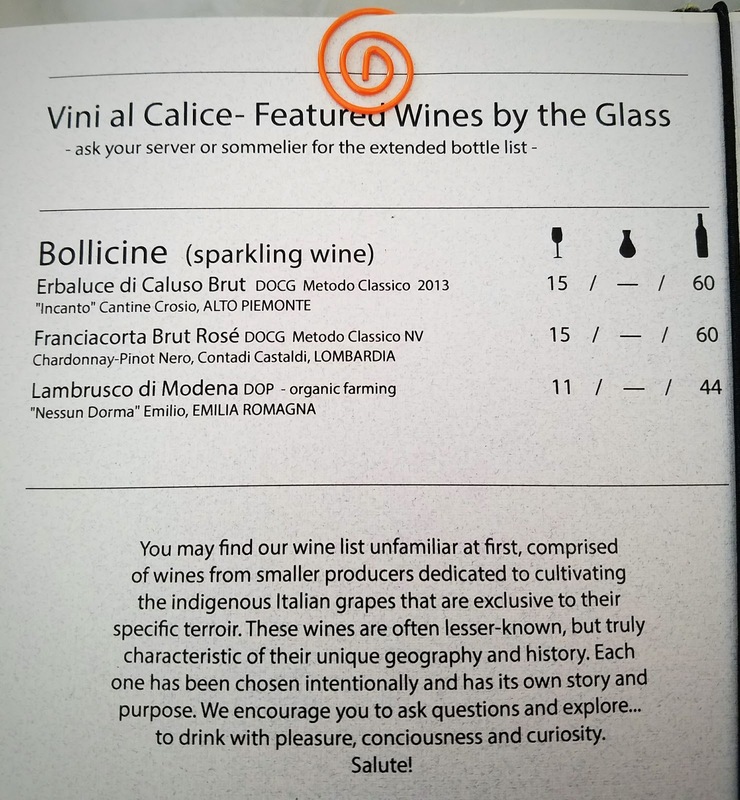 The wine has an easy-drinking 10% abv number and sells for $24, a little pricey considering a good prosecco is half that cost. The winery seems to hang their hat on a blue-bottle Moscato, which is eye catching and likely on the sweet side, too. The bubbles are cheery enough despite their quick disappearance. The nose is floral, and that's an understatement. Bouquets of flowers are in this bouquet. On the sip, things only get better and sweeter. It's not sugar overload, though. It's a nice, sweet, flirty, pleasant sweetness - not for dessert, but for anytime. TVWA's director Krista Chaich says the 50th Anniversary wine perfectly represents the "People, Passion and Perseverance" theme of Temecula Valley Southern California Wine Country. She says the 50th Anniversary wine will be available for purchase at special events and through Hart Winery, retailing for $50. Special etched magnums will also be available for purchase. This Temecula wine is a medium dark beauty. It offers up a bit of oak on the nose, but it smells beautiful. Smoke, vanilla, tobacco, dark fruit. It may be a little heavy-handed, but it's enticing. The palate doesn't completely follow suit, though. It tries to be a Rhône, but trips up about at Pinot Noir. One or the other, okay. In between, not so much. The wine tastes pretty good, but it's a bit thin, with some tartness that's not really welcome. Nice try, but it misses. There are plenty of good wines being made in Temecula, though, so don't let this scare you away. "Strength, nerve and courage" is on the label of the Matsu wines from Spain's Toro region. Matsu means "wait" in Japanese, says the winery. It's a tribute to "all the viticulturists who have been working in the vineyards for generations." 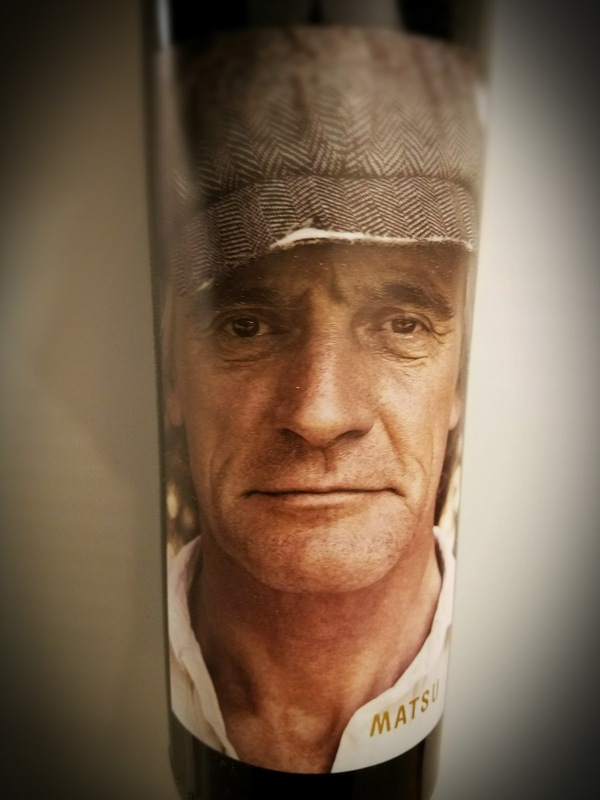 The label also features images of real life viticulturists, to a somewhat startling effect. Spain's D.O. Toro has a dry climate, extreme temperatures and 100-year-old vines. The grapes were biodynamically farmed and harvested in early October. Matsu's 2015 El Recio is made entirely from Tinta de Toro grapes, which is the Toro name for Tempranillo. The vines are nearly a century old and the wine was fermented in concrete and aged in French oak for 22 months. Alcohol hits 14.5% abv and the retail price is $22. This beautiful Toro wine is dark, deep and delicious. The grapes make a wine of such a deep indigo that no light comes through it. Aromas abound, like blackberry, cassis, anise and vanilla. The flavors run along those same lines, with big, jammy fruit and a tarry understroke. Acidity is spot-on and the tannins are plenty firm without being a distraction. Summer has come and gone. Labor Day capped another vacation period with terrible traffic and a "last chance" attitude toward miniature golf and Bermuda shorts. It's the time of year when people turn their attention away from the lighter, whiter wines that refresh and replenish, and look forward to a winter of hearty reds to warm the insides and pair with meaty, soul-filling dishes. For me, though, it's always white wine weather - I drink mine at room temperature, the better to savor the aromas and flavors which are sometimes softened by a chill. I also like mine with more than salad and seafood, as the higher acidity levels found in many whites makes for a great match with pork and chicken. And turkey. It's getting to be the time to think about turkey. Cornerstone Cellars' winemakers Charles Thomas and Kari Auringer can be proud of the Sauvignon Blanc they helped create. Thomas has a 30 year track record in the Napa Valley, while Auringer is in her second go-round. The 2016 Cornerstone Cellars Napa Valley Sauvignon Blanc is crisp and delicious, floral and fruity, as if New Zealand is a thousand miles away. Well, actually more like seven thousand. 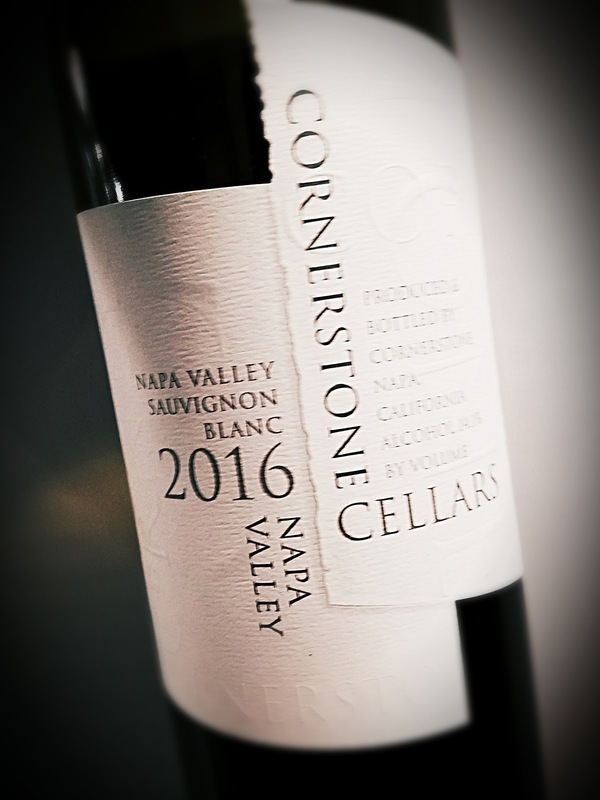 Cornerstone says the wine has a little bit of the Musque clone, "which adds complexity and a hint of sweet fruit." It was fermented in stainless steel tanks and neutral oak barrels, giving it more heft than a run-of-the mill SauvBlanc. Alcohol hits 14.1% abv and it sells for $30. This gold-green wine smells slightly of herbal notes, but the nose carries loads of peaches, apples and lemons. The palate shows the same fruit flavors, scant herbs and a very nice acidity. Citrus lingers on the finish and leaves a clean memory. "It smells like my grandfather’s cellar," my wife said as she sniffed at my lunchtime Lambrusco. She recalls fondly how the barrel in Grandpa's basement filled the room with the aroma of grapes. He and his neighbors would gather the grapes that grew on their trellises and contribute to the communal fermentation. Long after Grandpa's passing, she told the story at a family dinner of how she sneaked down the stairs as a child and drew off a sample to taste. It was forbidden, and so much more desirable as a result. Grandpa was her hero, and she held him at the highest esteem. He could do no wrong. She sipped the liquid and spewed it out onto the floor immediately struck dumb by the acidic liquid. She held the secret for decades, the secret that Grandpa made bad wine. At this point in the story, Grandpa’s son Uncle Joe interrupted to say, "Grandpa didn’t make wine, he made vinegar!" A round of laughs ensued. Relieved, my wife could put to rest the awful thought that Grandpa had failed at something. It may have been crappy wine, but it was the best vinegar they all had ever had. 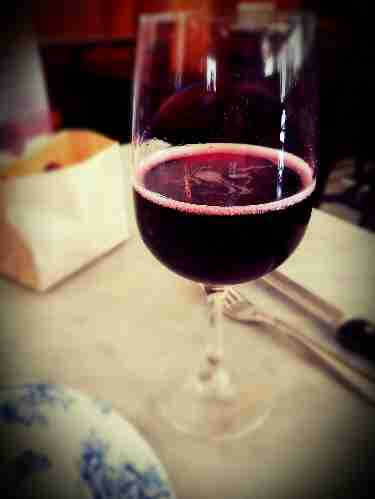 Anyway, the Lambrusco di Modena at Terroni in Los Angeles reminded her of Grandpa and me of that story. The "Nessun Dorma" is from the town of Modena in Italy's Emilia Romagna region. When they're not making balsamic vinegar or sports cars, they make wine. This one is made from mostly Lambrusco di Grasparossa grapes, with a splash of Salamino. It sells for $11 by the glass at Terroni, where the wine list has a delightfully Italian twist. I see it offered online for $17 a bottle. It's a good wine, a slightly fizzy wine with a dark color and that wonderful, grapey Lambrusco aroma. On the palate it's completely dry and carries a gentle acidity. The taste takes me back to childhood, to those grape icicle pushups that were so good in the summer. The wine, of course, has none of that sweetness but it harkens back to that deep flavor. It's no Riunite. It's a very good wine which stands on its own merit. And when you want a good Lambrusco, nothing else will do. It goes great with eggs and sausage, by the way. One of the great things about Italian wines is that there's always a new grape experience around the next corner, even when there's not. The bottle of Donna Fugata Lighea promised Zibibbo grapes from Sicily. That sounds exotic, but Zibibbo is also known as Muscat of Alexandria. MOA originated in North Africa and was good enough for Cleopatra, they say, so it's good enough for me. The grapes for Donna Fugata Lighea 2016 were grown on head-trained bush vines on the island of Sicily, fermented in stainless steel and aged in vats for two months, then three more in the bottle. The alcohol sits easy at 12.5% abv and the price comes in just under $20. The label waxes poetic about the "disheveled tresses" of the "bewitching siren" Lighea. That's how Giuseppe Tomasi di Lampedusa describes the label's focal point. This pale golden wine's nose is brimming with orange blossom, like a walk in the garden. The palate also plays up the orange, but includes sweet lime and lemon in the mix. The mouthfeel is brisk and racy, with enough acidity to handle anything you'd normally pair with a white. This wine will be a hit with lots of seafood, like shrimp scampi, oysters and grilled octopus. California Pinot Noir is a curious beast. Most bottles will be nothing like what you expect, maybe even want, from Pinot. The really Burgundian examples are few and far between due in part to the ripeness the grapes can achieve in the Golden State. Like it or not, Cali Pinot is usually bold, not bashful. 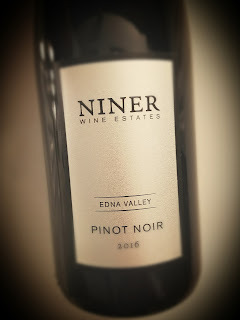 Niner Wines has a fantastic facility in Paso Robles - tour it if you get the chance - but the grapes for the Niner 2016 Pinot Noir came from Jesperson Ranch, their cool-climate Edna Valley estate vineyard. There was some whole cluster fermentation and French oak aging, with about a third of the barrels new. It's labeled as 100% Pinot Noir, carries an alcohol level of 14.1% abv and retails for $35. This wine is medium dark in the glass, a bit more opaque than usual for Burgundy, a bit less than usual for Cali Pinot. The nose carries some really dark blackberry aromas, with not a hint of sweetness. There's a little black tea coming in beneath the earthy minerals. I get a slight note of bramble or sagebrush, too. Savory rules the palate, too, with tar, dark berries and earth all over the place. As I so often find in California Pinot Noir, I'm overwhelmed by the heft and depth of the wine. It may not be my style, but when the savory angle takes charge I can forget that it seems like I'm drinking Syrah. Bring on a ribeye steak for this one, or a porterhouse if you can handle it.